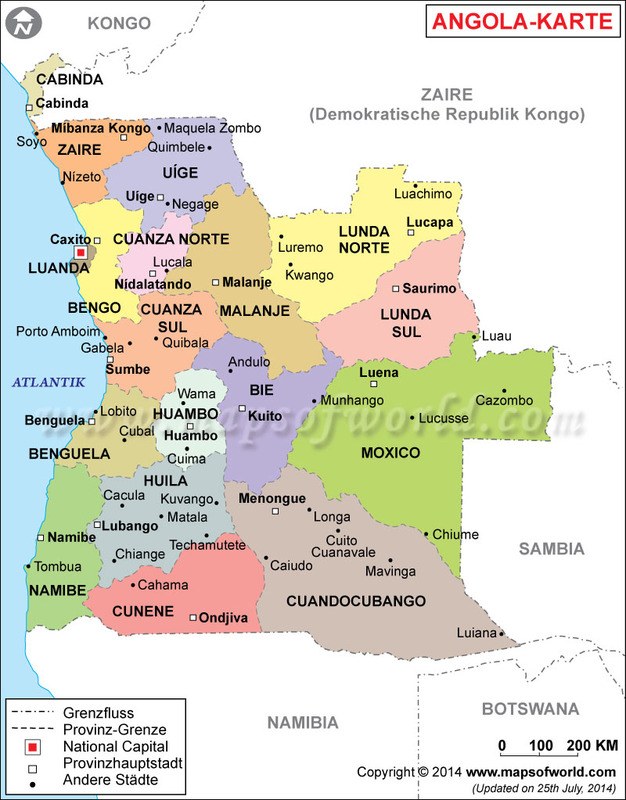 The Republic of Angola is located in south-central Africa. It shares its borders with Namibia to the south, the Democratic Republic of Congo to the north, Atlantic Ocean to the west, and Zambia to the east. The Republic of Angola has a very long history of human inhabitation, from the Khoisan people to the Bantu, with various empires throughout history. Significant kingdoms of historical Angola included the Kingdom of the Kongo, and the 15th century Mbunda. Portuguese explorers arrived in Angola at the end of the 15th century, founding the colony of Luanda in 1575. The name Angola was given by the Portuguese, derived from the local kings. Angola was an important settlement for European trade, including the slave trade. Except for a period of occupation by the Dutch, Angola remained under Portuguese rule as an overseas province until the outbreak of a revolution, in which the people of Angola fought for independence, succeeding in 1975. After gaining independence, Angola suffered internal conflict and fought a civil war, lasting 27 years, and ending finally in 2002. Today, Angola continues to work towards strengthening its economy and maintaining stability, though it remains one of the poorest nations in the world, despite oil reserves. 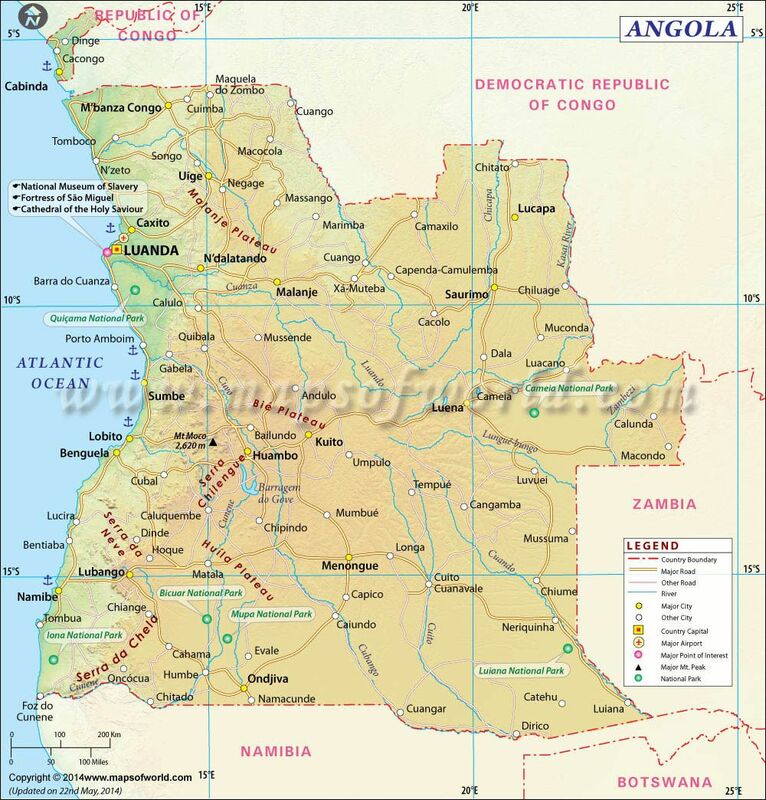 Angola is located in southern Africa, along the west coast. It features 1600 kilometers (994 miles) of coastline, with beautiful tropical beaches. There are several rivers that traverse Angola, including the Kwanza (or Cuanza) River, and its tributaries the Lucala and Cutato Rivers, and the Cunene River. Angola's interior features the high plateau as well as mountains, like the Serra da Chella range, the highest peak of which is Mount Moco at 2,620 meters (8,600 feet) above sea level. Also inland are regions of dry savanna as well as rainforests. Angola is home to several destinations of natural beauty, including a few national parks: Cangandala National Park, Iona National Park, and Kissama National Park. Angola's territory includes Mussulo Island, off the coast of Luanda which is a popular destination for travelers for its beach paradise. Another major attraction in Angola is the Palacio de Ferro in the capital, Luanda. This palace was designed by Gustave Eiffel, who also designed the Eiffel Tower in Paris. The capital has several museums, a few fortresses, churches, and the massive obelisk, which is the mausoleum of the first president of Angola, Augustinho Neto. The most common way to enter Angola is via airplane to Luanda's Quatro de Fevereiro Airport. There are no trains, buses, or official ferries that enter Angola from other countries, though boats can be chartered. A railway system within Angola does exist with three separated lines. There are roads in Angola, so driving is possible, but the road conditions are not great and there is a high potential for obstacles such as livestock. Adopted on 11th November 1975, Flag of Angola consists of two horizontal stripes in red and black color.